Dry eyes symptom: Hydrolarm, the natural hyper hydrating solution that quickly relieves your eyes, in its easy-to-use dosing bottle! Innovative «eye drops»: your dry and tired eyes will appreciate the soft and efficient hydration as well as the precise dosage of Hydrolarm on the cornea. Hydrolarm solution contains hyaluronic acid (or Sodium hyaluronate), the most hydrating element to this day. This is the reason why Hydrolarm offers your eyes a deep and soft freshness sensation. Hyaluronic acid is part of your tears. Hydrolarm is a very natural artificial tears solution. Thanks to its patented dosing valve system, you can put the exact number of drops you want on your tired eyes. You will appreciate a generous 15ml bottle you can control to the drop! Hydrolarm is the perfect solution to treat dry eyes symptom. It bears no secondary effect and it can be used as often as necessary. Hydrolarm is perfect for contact lens wearers. You do not need to take the contact lenses off to soothe dry and sore eyes, mistreated by long working hours in front of a computer screen. Do not hesitate to go through «Drops for your eyes: the Hydrolarm solution» for all tired and sore eyes. Hydrolarm eye drops, a very hydrating and safe solution to soothe dry or sore eyes. Working on a computer screen, doing precision tasks such as sewing, reading or tailoring for example, can lead to early eye tiredness. Menopause, some medicines or simply ageing, make your tears scarcer. Air conditioning, pollution and pollen often make your eyes sore. Tiredness and sore eye procure a sensation of discomfort, dryness and tingling of the eyes. Hydrolarm soothes tingling due to sore eye and quickly eases the sensation of discomfort. Hydrolarm safely soothes and hydrates adult’s and children’s eyes, whether they wear glasses or contat lenses. If you need your eyes to be hydrated a few times a day, drop some Hydrolarm on your cornea. The bottle is generous and Hydrolarm does not bear any secondary effect. This is why all sore and tired eyes do like Hydrolarm! Innovating artificial tears give your eyes a deep sensation of freshness and a maximum security. Thanks to its elaborated formula and to the presence of hyaluronic acid, Hydrolarm offers a real hydration and a sensation of freshness to your eyes. Hydrolarm does not contain any conservative, it is perfectly tolerated by your eyes and do not cause any sore eye. 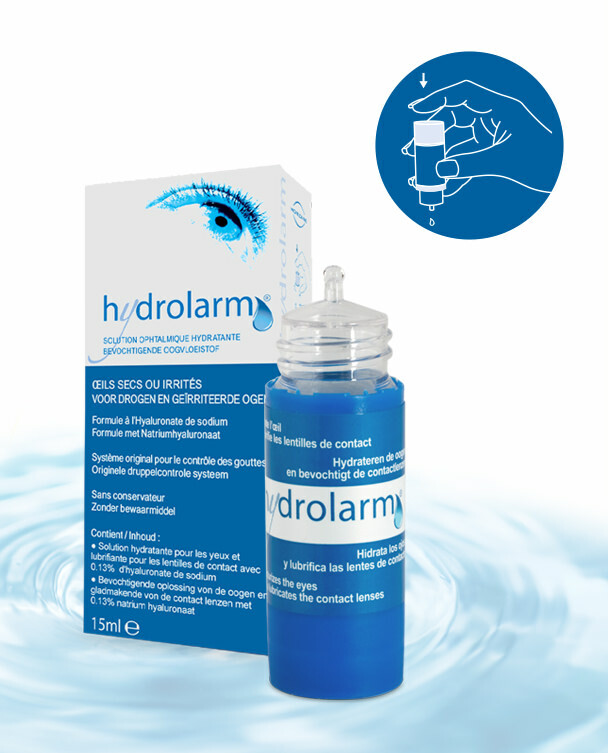 Hydrolarm is a drop solution for your eyes you can safely use, so as children. If you wear contact lenses, you can use Hydrolarm without taking your contact lenses off. Hydrolarm composition is the same as your natural tears. A patented bottle that allows you to put as many drops of hyper hydrating Hydrolarm you want on your eyes. Drops for the eyes can sometimes be stressful and complicated. It is also difficult to control the number of drops falling from the bottle. Hydrolarm has a special patented dosing valve. You just need to gently press the valve located at the bottom of the bottle and a drop falls on your eye. It is easy, convenient and economic! With Hydrolarm, you decide how many drops you need, not the bottle! Dry eye sensation or sore eye due to pollen can sometimes be so annoying that your eyes need to be hydrated many times a day during a few weeks. In order to answer this need, Hydrolarm offers a bottle which volume can be the double as the other traditional solutions (50 to 100% more). It is important to hydrate your eyes. You will not have second thoughts anymore when moistening your eyes as you know you do them good! Close the bottle firmly and take it away with you. It will perfectly suit your bag or your pocket to hydrate what you care most about: your eyes! Why do your eyes love Hydrolarm, a natural and sterile solution, so much? • A very hydrating drop solution for sore and tired eyes that can be used anytime by anybody without any restriction. • Very easy for everybody to use thanks to its dosing valve: you can put as many drops as you want. • An elaborated formula for quick efficiency and maximum tolerance for everyone including contact lens users. • Only available in pharmacies: Hydrolarm is a sterile medical device. Your pharmacist guarantees the quality of the eye drops that have been elaborated and tested in a pharmaceutical thus sterile environment. Hydrolarm: a natural solution to soothe dry and sore eyes, recommended by your pharmacist. It is difficult and useless to go and see an ophthalmologist when you suffer from dry or sore eye. Hydrolarm, which is a high hydrating and efficient solution, will soothe your eyes and give them comfort, freshness and relief. Hydrolarm is a medical device recommended and sold in pharmacies.